Wow! We’re already 4 days into 996 Appreciation Week. 7 days just isn’t enough to show the 996 the love it deserves, so I’m going to have to pack them in going forward. 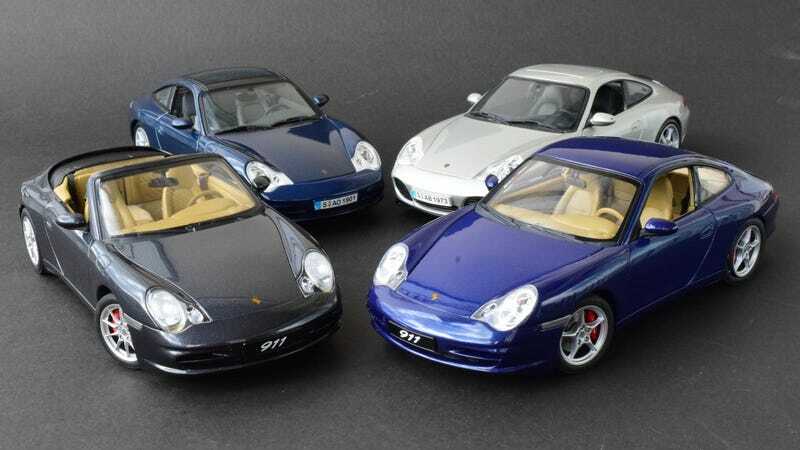 For Day 4 we have a quartet of 996s from AUTOart and Maisto, all in Mk II guise. These 4 are featured today as they are the “basic” 911 models performance-wise. From AUTOart we have the Carrera Coupe and Cabriolet, and from Maisto we have the Targa and Carrera 4S. The AUTOarts are some of the brand’s earlier models, and as such they aren’t too much different from their UT ancestors I showed yesterday. We now have carpet, and the brake disks are metal, but just about everything else, including the dogleg door hinges, is the same. The Maistos, much like their 997, are in my opinion among their best efforts. They don’t offer the level of refinement that the AUTOarts have, of course, but put them on the shelf and they look just as good. Also, if you want a Targa or C4, Maisto is the only game in town.